Super Typhoons Parma and Ketsana kill over 1,000 in Asia. He said SUSA was the target (SamoA is the correct first and last letters of one of the key places). A GREAT QUAKE (8.0+ or more) did strike SAMOA on 9/29/9 a triple date. 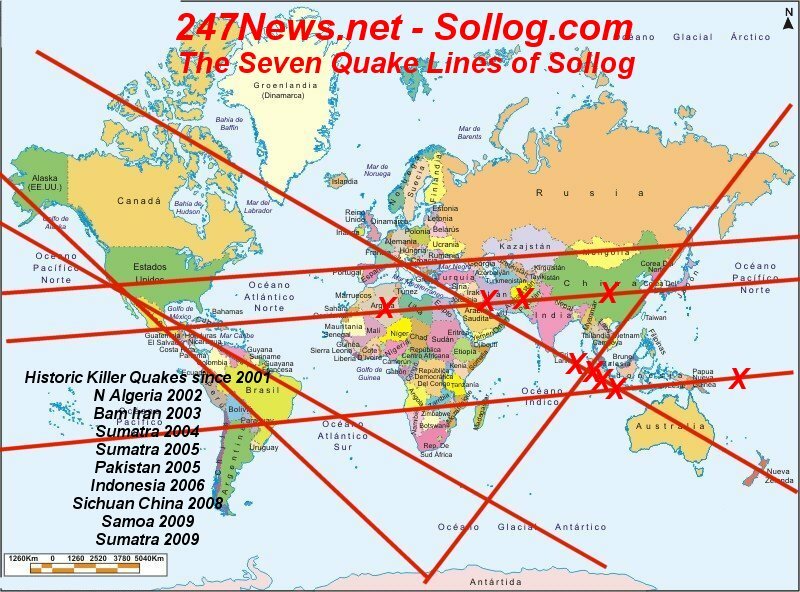 Sollog listed around 100 capital cities in that 'warning', he says the cities form several LINES OF TRAGEDY and all these areas are on THE LINES he says are made from connecting the capital cities in his 2001 Great Quake Prophecy. It is quite amazing how so many 'capitals' on our world map can be found on so few "lines" and the fact that every historic KILLER QUAKE since 2001 has struck one of the SEVEN QUAKE LINES OF SOLLOG. While the 2001 Quake Warning of Sollog did not name the exact areas struck, they do created the SEVEN QUAKE LINES OF SOLLOG in the map below. And all the remote areas to suffer HISTORIC KILLER QUAKES since 2001 that killed THOUSANDS are indeed ALL ON THE SEVEN QUAKE LINES OF SOLLOG. The recent headline WRATH OF GOD STORIES have clustered as Sollog warned on a date when there is a TRIPLE NUMBER DATE. While Sollog is well-known for hitting EXACT DATES for large quakes and being very accurate in some locations as well, the fact that so many lives have been taken by QUAKES and the quakes all struck ON THE SEVEN QUAKE LINES OF SOLLOG is well, AMAZING. But that's why he's known as THE AMAZING SOLLOG.